After seeing today's Sweets, I think you'll join with me in saying: Play on, Playahs - play on. Moving beyond the land of Zelda, how about a Disney/old school SNES/Mii mashup? All together now: Awwww. Love how the bride and groom displayed their Disney name tags, too. From a distance I thought all these tiny bits were printed on edible paper, but if you look closely you can see that they're all either molded fondant or piped icing or both. Yowza! And it gets even awesomer. Next, we take the amazing Mario wedding cake and surround it with amazing side cakes! Frances' daughter Mariel sent in the first photo to brag on her mom, and then Frances herself sent in the second pic. Thanks, ladies! *Yes, that IS a lame Taco Town reference. Sorry. 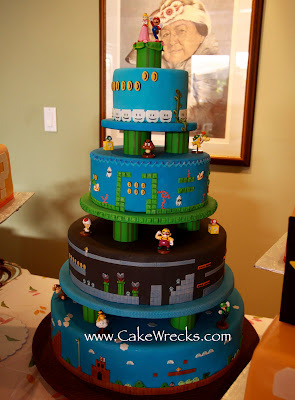 I think I need to start working on getting a husband #2- simply to have that Mario cake at the wedding. How gorgeous. I'm astounded at the level of detail the baker put on the Mario cake. You posted a cake that has one of the special cake toppers made by my friend Paul!! Awesome!!! He will be happy to be on such an awesome website!! 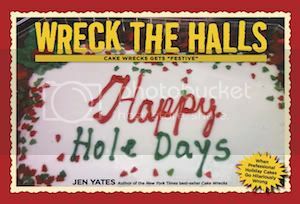 :) I cant get enough of CakeWrecks!!! The Zelda mosaic is so sweet! The Zelda mosaic is so sweet! 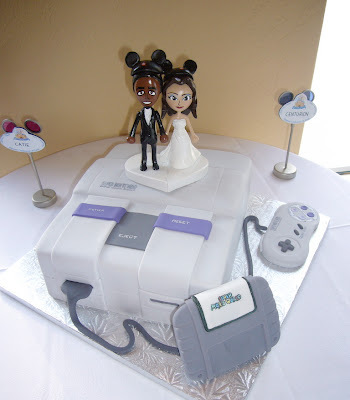 I wish I could re-do my wedding to include a beautiful, nerdy cake. "Moving beyond the land of Zelda, how about a Disney/old school NES/Mii mashup?" The Mario cake... "astoundingly detailed bit of Awesome" is right! The other cakes were very well done too, but that one is by far my favorite (of course, the fact that I'm a huge fan of old-school Mario may have something to do with it). Wow. that is all I can say. The Mario cakes are freakin' amazing. I'm in awe. I am in awe of the Mario cake. Mario wedding cake will be one of my demands if I ever get married. The Mario Bros. cake is amazing. My inner old school video game geek is weeping with happiness right now. But I really shouldn't let my sweetie know that game cakes are an option, because he'd want a Metal Gear cake. Or a three-tiered Resident Evil, with a magnum-wielding Wesker on top. And that could get ugly. Those cakes are amazing! The Mario one was just fabulous. How come none of my friends get married with cakes like these? It'd make the receptions more fun. The Mario cake is unbelievable. I want it. Also, I had the pleasure of introducing a couple of friends to Cakewrecks the other night. The laughed for hours at the Literal LOLs. Two more converts! Yay! I did have one cake in my life that was wonderful but you are leading me to cake lust. Especially the "Mario Town" cakes. Wow. I will add that, since finding you, I have made an effort to bring well decorated cakes when it's my turn to do office birthdays. Thanks. Thank you, CakeWrecks, but our Sunday Sweets are in another castle. Bad puns aside, that Mario cake is a thing of beauty. Actually, 'beauty' doesn't do it justice. Genius. It's a thing of genius. Looooved the 100 game cupcakes game. I totally geeked out when I saw the Tempest cupcake. That was my favorite arcade game back in the day! If we were getting married now, I'm sure hubby would want a cake like this. Can't want to see both the wrecks and wonderful cakes ppl come up with for Avatar! BTW: hope you enjoyed your day off. WV: mardumbe: a newbie who is uninformed about Mario Bros. Thanks to cakewrecks, I now have my daily "AWESOME!" and my daily trivia. Or at least, my memories have been cleared. Apparently, I grew up with the NES, not the SNES (as mentioned by the above posters, my NES didn't look much like that). Hurray! These cakes speak to the Nintendo geek in me:-D I'm a little surprised at the halfassedness of the wedding though (check out the video if you haven't). I mean if you're gonna have the cake, the music, the ring and the cufflinks/jewelry, everyone in the wedding party (including bride and groom) should've been in costume. I mean if you're gonna go gamer geek, go all the way! That mario cake is amazing. I hope they didn't eat it. It's too pretty. They should just shelac the hell out of it and put it in a museam of amazing cakes. She's like the Susan Goil of cakes. That Mario cake is amazing. The cake maker is obviously the Susan Goils of cakes. Cupcake mosaics= much better than cupcake cakes. Wow, the Mario cake is my favorite! The lady who made it is the Susan Goils of the cake world. And thanks for the link to the cupcake game. I called my kids to the computer for that one. I was surprised at the ones they knew that I didn't! I need that Mario wedding cake! Sure, I'm not getting married anytime soon, but it's so awesome that you can't not have it. #53 thinks LAMA is a word! And it's a Scrabble game! LOL! AH MA GAH! I am nerding out and my teeth hurt! The details on that Mario cake. Wow. Just wow. Super Mario and his pals make for great cake designs, because they're so cute and whimsical. So when you get a baker with that level of talent, a masterpiece is bound to happen. I was never a gamer geek girl, but I adored Tetris. I'd love to see a Tetris cake! The Mario cake was awesome. I would love to have something like that for my wedding cake. I just do not think my fiance would go for it. Now if it was Modern Warfare, he would. I love all the detail. Saw CW featured on an entertainment show yesterday...maybe Hot Topics? Lots of cool piccs from the book. What confuses me is "where are they getting the money for these weddings?" My ex was a gamer, and he was unemployed half the time! But that Mario cake is a masterpiece. I love those little squids! I'm glad it finally made it here. The flavours were just as amazing as the cake: Lemon, Strawberry, Chocolate and Pina Colada. Thank you Cake Wrecks for posting about Gamer Cakes. You featured one of my toppers on the SNES cake! It's good to see that Gamers and Geeks are getting their day in the sun. Love love love the Mario cake. Cupcake mosaics - interesting idea, especially to represent pixelated things like video games. They're much better than CCCs for sure! Thanks for the 100 Games Cupcake Game link. My husband impressed me with his game knowledge. I think the cutest one was the minesweeper cupcake. I've seen the Mario cakes. Amazing. Touches my geeky soul. But our wedding will likely have subtle Lord of the Rings and Harry Potter references. even though I grew up in the 80's/90's, it was in a house sans Nintendo, I didn't discover the joy of video games until I was an adult. Still, I heart these cakes. So awesome! But, in the 100 cupcakes game, #11 is called Pass the Pigs... Great work though, must have taken a lot of time. I want that Mario cake. But I would leave out the basement layer. Too much black icing. LOVE LOVE LOVE the Mario cake!!!! 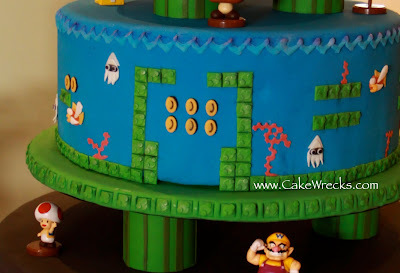 That Mario cake is what I definitely like and what I really want for my kid's birthday! I read often but rarely comment. these are amazing cakes. SWEET! Thanks for the cupcake game link-- it was fun to remember some of those! Now, in my time, I have seen some wonderfully detailed cakes, but never, EVER have I seen one with such detail and preciseness that I think it is a screen print. Being a person with low vision, it is just... I am out of words. Me and a friend will take on the challenge of 100 cupcakes, and see if we can do it. Has it been done before today? I am so totally out of the loop here. I DO know who Mario is, but that's it. I know nuttin' else! I was a geek/nerd growing up, but one who had her head stuck in books and science projects. We owned one video game our entire lives . . . and I'm really going to date myself here . . . it was "Pong!" But the cakes are gorgeous and I don't have to understand the content to admire them! WOW! That is love for video games! 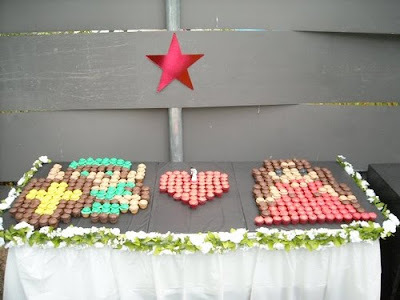 That wedding cake with all the Mario stuff is just AMAZING! That must have costed a fortune! They weren't merely misspelling llama. I love, love, love the Mario cake! Oh, how cute! 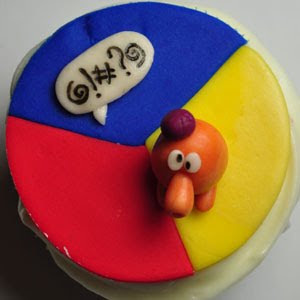 A Q-Bert cupcake! (I used to love playing that game). I feel so absolutely and wonderfully nerdy because I *squee-ed* when I saw that the first few cakes were for Zelda-lovers. And the Mario cake made my jaw drop. GORGEOUS work! 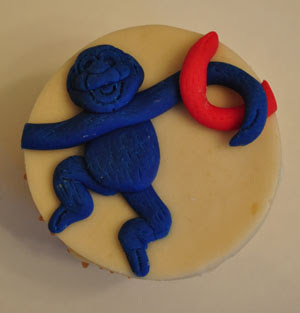 Oh come on, SURELY someone has made a tiered Donkey Kong cake, right? The Mario cake is the best one I've ever seen. Ever. Truly amazing. Ahhh...look sweetie! We can't name him John. He looks just like a little Roman soldier, so let's name him Centurion instead. "The one-L lama, he's a priest. The two-L llama, he's a beast. There isn't any three-L lllama. [Footnote: The author's attention has been called to a type of conflagration known as a three-alarmer. Pooh.]" WV: caentest. Like the Washington Post Style Invitational, I suppose, only posed by a columnist for the San Francisco Chronicle, while he lived. That top cake (the mosaic) is from our wedding! We had to shoo people away from it because they were eating it before we even got to "cut" it lol. 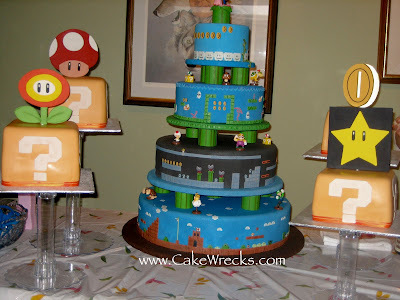 All of these cakes are absolutely amazing though and that Mario cake is a piece of art! There are no words for the awesome... and she does it as a HOBBY. No, really, it simply makes me happy that there are people out there who get the most romantic feelings when videogames are involved in a cute and nerdy way. This is so touching. The best part? The topper was super-sculpy, so we will keep it forever! i think it is scary and maybe deserves to be on the main page. go check out #90. it is the game of life (sorry for the spoiler) but the women (the pink sticks) just dont look right... they maybe remind me of something else! WOW... that first Link one... Unless I'm mistaken, isn't that the first cupcake cake that you've ever given a pass to? I'm Frances and I am the person who created the Mario cake. It is a dummy, and unfortunately the bride and groom for whom it was made could not take it home with them. So if any of you out there would like it, you can have it. I live about 20 minutes west of Toronto, Ontario. I was so happy when I saw that Wind Waker cake, having just recently got my Game Cube out again and played it through... until I noticed the Cucco/chicken. There aren't any in Wind Waker! It should be a pig! I'm just wondering, in the 100 gaming cupcakes, why is there Duke Nukem, Quake, WoW, Halo... But there's no Doom? It's insane! 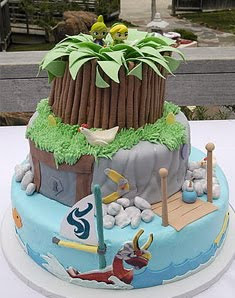 That Wind Waker cake looks mighty enticing. I would have to say that the Mario cake is totally my brother. In fact he is even playing New Super Mario Bros. Wii right this second! After the mario cake either a zelda or final fantasy tribute seem to be in order. A cake with the Master Sword from Zelda set still in the stone, complete with ivy running everywhere and hylan runes on the stone's base would be awesome. Lots of options for a final fantasy cake though - not sure you could pin down any one iconic thing to base it on that would actually work for a cake. I went to that 100 cupcakes thing and whisper-yelled when I saw a symbol of a game that I knew.The ones I knew were mostly board games, but I'm not that geeky and 10 years old, so that explains why I only knew apples to apples, candy land, scrabble, etc. Isn't It Ironic? Don't Ya Think? Better Late Than Never: Happy New Year! Ever Feel Like ----Thing's Missing?